Sly Dunbar (drums) and Robbie Shakespeare (bass), the arrangers, producers, songwriters, session musicians and developers of raw talent, are widely acknowledged as ‘the world’s greatest rhythm section’. ‘The Riddim Twins’ have been together for over 40 years….between them they are estimated to have played on or produced over 200,000 recordings. Their list of collaborators is a veritable who’s who – there’s every prominent Jamaican artist from Beenie Man to Sean Paul to Peter Tosh, Don Carlos, Michael Rose, Junior Reid, Shaggy, Cherine Anderson, Bitty Mclean, Black Uhuru, Gregory Isaacs, Dennis Brown, Ini Kamoze; and they have played with and produced artists such as Ben Harper, Bob Dylan, Mick Jagger, The Rolling Stones, Grace Jones, Paul McCartney, Carlos Santana, Sinéad O’Connor, Britney Spears, Alicia Keys, UB40’s Ali Campbell, Joe Cocker, No Doubt, the Fugees, Michael Franti and countless others. Sly and Robbie, affectionately known as the Riddim Twins, are perhaps the premiere architects of the modern sound of Jamaican music. Building on the cornerstones of Studio 1 and other early pioneers of the Jamaican recording industry, Sly and Robbie became the driving force behind the fabled Channel 1 sound that dominated reggae throughout the late 70’s and early 80’s. Subsequent work, most notably with Peter Tosh and Black Uhuru, set the pace for the changing sound of reggae in the post-Bob Marley era. They continue to record and build bold new arrangements working consistently in the present moving into the future. Sly and Robbie also have an extensive tour history on the world stage. Their group the Taxi Gang includes a horn section and features an ultimate lineup of top Jamaican recording musicians. 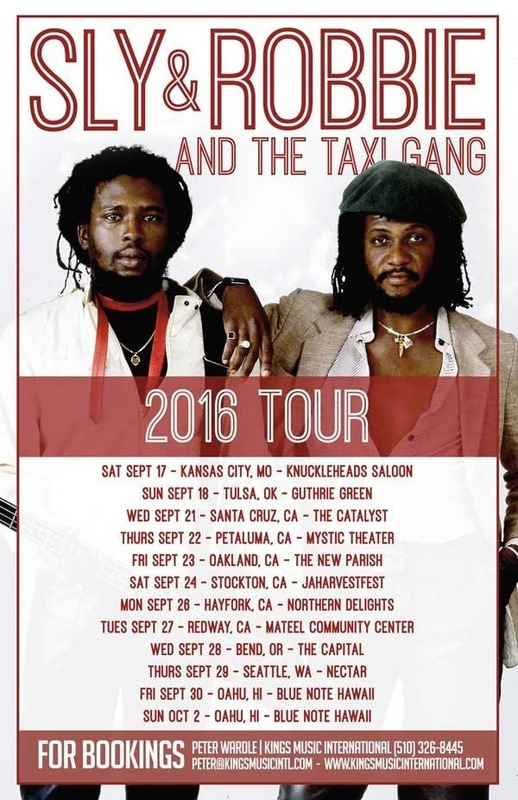 Sly & Robbie and the Taxi Gang have recently been top performers on the Tribute to the Legends, the Sierra Nevada World Music Festival, Reggae in the Desert and Reggae on the River. They tour North America, Canada, Europe, Japan, Australia and China. When Sly and Robbie and the Taxi Gang perform their music is far outside of the box – jazz Reggae – very courageous and experimental. Theirs is roots reggae music at its heights.